blic Employees. Over 2,100 delegates, representingCUPE locals from across the country, elected Hancock to lead Canada’s largest union. The vote took place at CUPE’s 27th biennial national convention taking place this week in Vancouver. “I will do my best each and every day for all our members across this great country. I am so honoured to be your national president,” said Hancock to convention delegates, after being elected. Hancock, who has been president of CUPE’s British Columbia division since 2013, won on the first ballot, defeating Fred Hahn, currently president of CUPE Ontario. “I congratulate Brother Fred for running such an energetic and exciting campaign. I look forward to working with him and all CUPE members to build our union into an even stronger voice for workers in Canada and around the world,” said Hancock. Hancock has been a member of CUPE 498, Port Coquitlam Municipal Employees, since 1984. 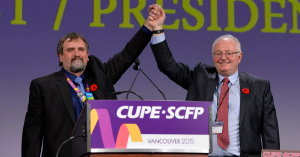 He succeeds Paul Moist, who is retiring after over 40 years as a CUPE member, including 12 years as national president. “Brother Mark is a dedicated activist and a proven leader, who I have had the pleasure and honour of working with for many years. He is a tireless trade unionist who will be a strong voice for CUPE members and all Canadian workers. I’m confident CUPE and the labour movement will grow even stronger under his leadership,” said Moist. Hancock will officially take over as national president at the adjournment of CUPE’s national convention on Friday, Nov. 6, 2015. Charles Fleury was also re-elected by acclamation as national secretary-treasurer. This and other news from the CUPE NATIONAL CONVENTION can be located by clicking here!